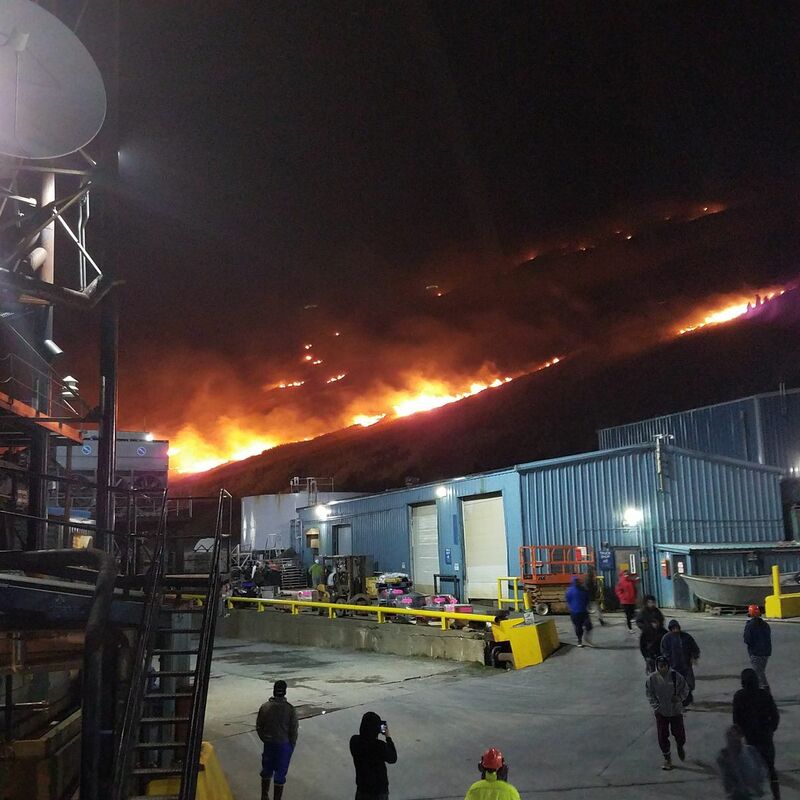 A fire at Trident Seafoods Corp.'s Akutan plant burned around 25 acres of grassy hillside near the Aleutian Islands town early Monday morning, but wasn't reported to the community's sole law enforcement officer, an Akutan official said. Monte Chitty is Akutan's village public safety officer. He also runs the village's volunteer fire department. "There's a failure of Trident to communicate with the village," Chitty said. Chitty said that the fire originated at Trident Seafoods' Akutan processing plant, about a quarter-mile from town. The fire burned between 3 a.m. and 4 a.m. Monday, he said. Chitty said he first learned of the fire when a media outlet called him at 8 a.m. Monday morning. Joe Plesha, chief legal officer for Trident Seafoods, said Tuesday that Chitty should have been alerted to the fire. The company would reach out to Chitty, Plesha said. The fire burned around 25 acres on the northwest side of the processing plant and on a steep hillside sloping up from the company's property, Chitty said. Chitty believes that the fire started from an area where the company routinely burns pallets. Plesha said the company was investigating the cause of the fire. He said it "probably started on our property," which includes some of the hillside above the plant, but that Trident was still unraveling the details of what happened. The plant itself was not damaged. Trident's Akutan plant is the largest seafood production facility in North America, according to the company's website. Around 1,400 employees work there during the peak season, but the plant operates all year. The plant can process more than 3 million pounds of raw fish per day, the site says. Akutan is about 760 miles southwest of Anchorage. Chitty said around 90 people live in the village, and the Trident employees live in company housing at the plant. 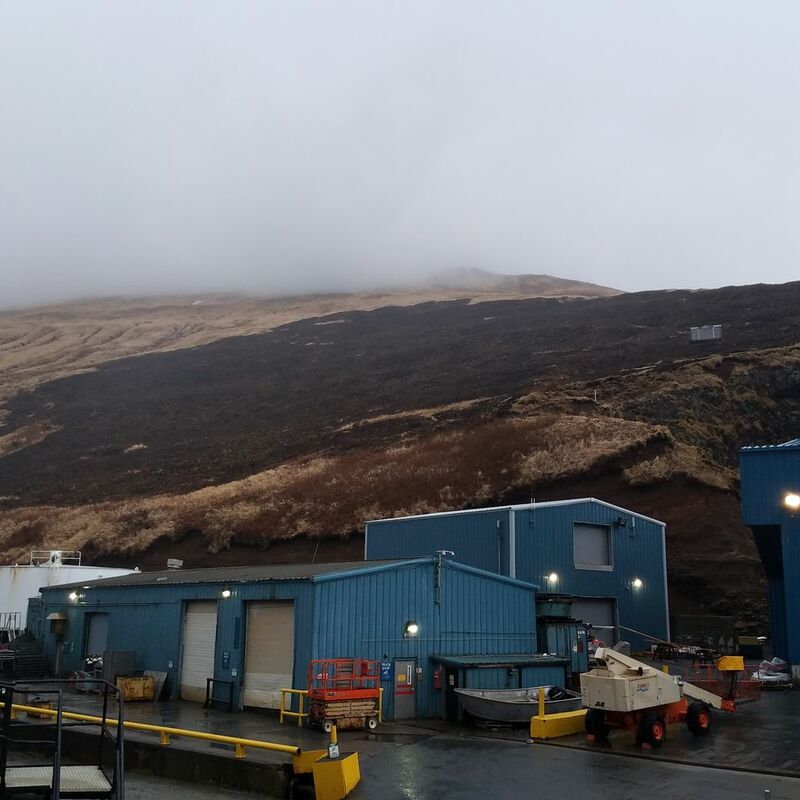 This time of year in Akutan, "the whole island is dry grass and the prevailing winds are over 30 miles per hour," Chitty said. "So, a fire out here could be a major thing. The only thing that saved us … was it started raining at 4 this morning," Chitty said. Volunteer firefighters in Akutan "work off of ATVs and backpacks," Chitty said. "If you've got a fire like that, it's got to be fought on foot," Chitty said. "That's why early warning is important."